Wow -- have you looked at Slotland on your phone lately?! 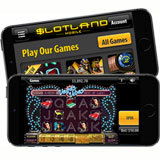 Slotland was one of the first to dabble with mobile casino games way back when. They just completed a big upgrade to their mobile user interface. The games look waaaaay better now! The mobile casino games now make even better use of the small screen space on smartphones -- in some cases, the reels are 50% bigger! For thumb-tapping convenience, they've made the buttons bigger. Slotland games are compatible with iPhones and other iOS devices as well as Android smartphones and tablets. Slotland’s newest game, Vegas Vibes, was designed with the new mobile casino technology in mind. It brings the bright lights of Vegas to any size screen. It’s a glitzy twenty payline slot with stars of The Strip like Elvis and Cher on its reels and a bonus round that awards free games where the wild becomes an expanding wild. Slotland has 35 real money online slot games, all available only at Slotland and all compatible with most mobile devices. The casino’s site-wide progressive jackpot is currently nearly $200,000 again after a $149,625 win a few weeks ago.